A completely irrelevant post on Facebook (a new flamethrower) brought something to mind that I hadn’t thought about in a couple of decades. It relates to the concept of defining the mission, desired outcome, and possible consequences. 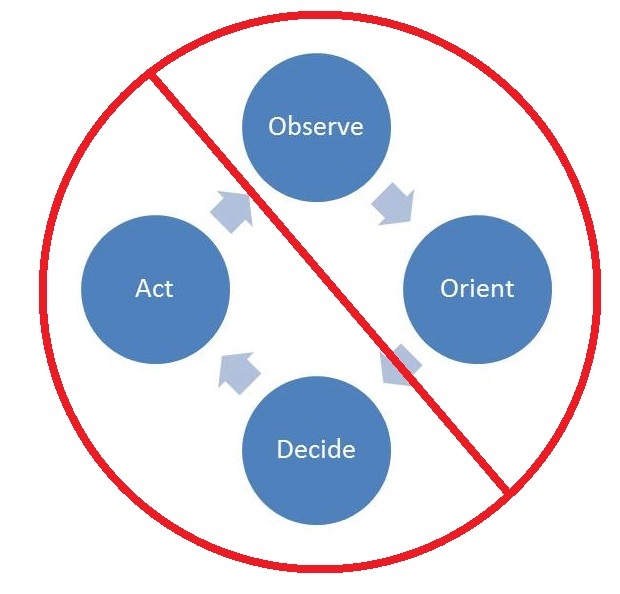 Those are things integral, yet unstated, to the Orient phase of the OODA process and fundamental to achieving success. Most discussions about OODA get caught up in the speed aspect, which is actually a tertiary part of the process. It’s not just a simple speed-based looping cycle, as is often depicted. Years ago, I had a friend who didn’t care for guns but kept a flare pistol for home defense. She mentioned this to me in conversation. Her logic was that she didn’t want to kill someone. My response was “So you don’t want to kill someone but you’re okay with launching something into him that burns at several thousand degrees and might burn your house down?” She said she hadn’t thought about it that way. It certainly would have been possible for her to Act quickly but would it have been a good decision? I don’t think so. It’s easy to get caught up in a linear process from the starting point without looking far enough down the path to a likely result and consequence. One component of Awareness is to keep your head up and look far down the road, just as you should when driving, rather than being fixated on the bumper in front of you. It’s important to note that what is considered the most successful recent example of Boyd’s thinking was the planning of the First Gulf War. It took months and involved several different iterations of the strategic plan. In Boyd’s original hand drawn diagram of the OODA process, he actually had three different loops; one depicting planning, one depicting execution, and a third showing an overlay of the previous two. The third version is the popularized full diagram but it obscures the importance of the analysis/synthesis part of the process. There are many inputs necessary, including consequences, before an effective decision can be made. That planning is what makes rapid, effective Action possible. Focus on the object, not on the obstacle.